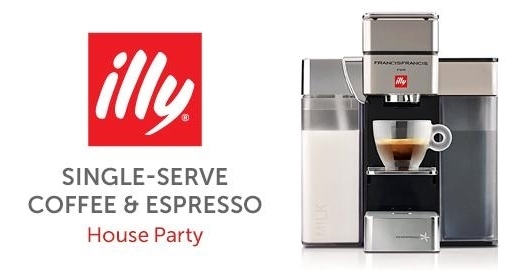 As a former Barista and self-proclaimed coffee connoisseur, I absolutely had to be an illy Y5 Milk, Espresso and Coffee Machine House Party hostess. Luckily, I was chosen and as soon as the party pack and Y5 arrived I began planning my tasting party. House Party provided me with swag bags, coffee, espresso, illy coupons and all the supplies required for a stress-free party. The illy Y5 package arrived right on time and we immediately began setting up the machine. The unit was mostly in one piece, except for the milk frothing pieces which were separate. I gave everything a quick wash and rinse and had the machine ready to go in no time. I spent a lot of time leading up to the party making my own coffee and espresso drinks. After just a few days, I packed up my old coffee machine and donated it to the office break room. The illy Y5 was here to stay! On the day of the party I picked up a variety of pastries and doughnuts to pair with the coffee and espresso tastings. I had the operating instructions video looping on my laptop for the first few minutes of the party to ensure everyone knew how to use the machine. The Y5 was a huge hit with everyone! From the coffee drinkers, to the latte drinkers, to the tea & hot chocolate crowd (the machine produces hot water) everyone had a smile! Flavor - The flavors of the coffee and espresso are just right. Not too rich and not too light. I drink my coffee black and my espresso as either an Americano (with hot water) or cappuccino (with skim milk) and all three drinks were exceptional. The integrated milk frother is a mind-blowing treat cup after cup. Design - We love the forward design and the small footprint the Y5 leaves on the countertop. Bigger isn't better. The Y5 is the perfect size. Functionality - The Y5 is simple to use. The operating instructions are a straightforward and the videos available online detail how to clean the machine (which is also simple). The kids at our party enjoyed making their own hot chocolates. Recycling - Although this machine utilizes a capsule system, illy collects the used capsules and recycles them rather then sending them to landfills. You can read all about the recycling program here. I'm in love with this beautiful little machine and the coffee and espresso it makes. I am happy to say I have finally found a machine I have no intention of replacing! 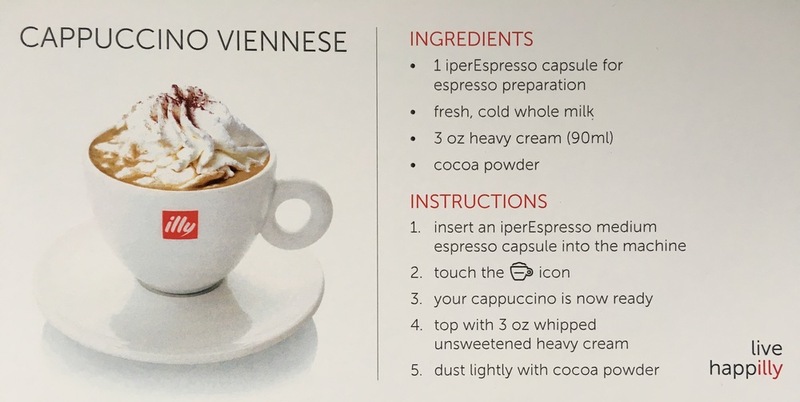 Guests at my party received a swag bag as well this Cappuccino Viennese recipe card which contains a $75 savings promo code for use at illyusa.com and Sur La Table. If you were not a guest at party but you'd like the promo code, sign up for my newsletter (sidebar on the right) and I'll send it to you! Disclosure: As stated in the first paragraph, I received the illy Y5 Milk, Espresso and Coffee Machine at no cost in exchange for hosting a House Party and providing an honest review of the product. All opinions are my own and those of my guests.